The images on NetXPosure.net come from a variety of original photographic artefacts, most of these artefacts do not state the subject matter therefore proving difficult to accurately identify. This page lists people who have been very helpful in making this site as accurate as possible. Ken & Edna Goatley were the most friendly and knowledgeable historians in Wokingham and helped identify some of the older Wokingham images and people. Edna Goatley died, aged 85, on the 3rd of April 2013 aged 86 after a long and painful illness. Known to many, both as a friend and as an authority on the history of Wokingham, Edna lived in Wokingham all her life. Her husband Ken, known as Mr. Wokingham, was well-known for his slide shows, Wokingham Past and Present that he gave regularly to acquaint the people of Wokingham of the town’s history and to raise money for charity. Edna Pick was born on the 21st of May 1927, in Denmark Street, near the clinic. The Pick family had moved from Plymouth to Wokingham in 1923 and her grandfather opened up the Wire Rope Works, first at No. 11 Market Place and then at the rear of 47-49 Denmark Street. After his death the business passed to his sons. The Wire Rope Works was quite successful, especially during the Second World War, when the War Department awarded the company numerous large contracts for a variety of cables. The company closed down in the early 1950s because it couldn’t keep pace with manufacturing innovations. When Edna’s parents died at an early age her aunt and uncle took her in. She and Ken began their relationship when she was seventeen. Their parents had been friends for many years and their children had known each other from an early age. 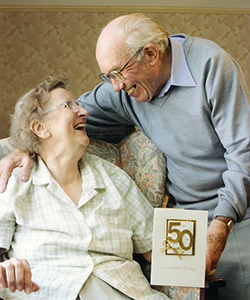 The happy couple were married in 1953. Edna recalled that their wedding took place on the same day as the town Welcome Home celebrations for British troops returning from Korea so she and Ken couldn’t hire sufficient tables and chairs for their wedding reception. She also remembered, when they returned to their new home as man and wife, their landlord, Mr. Lee, had filled every room with flowers. They were a fun-loving couple and they used to go camping around England, Scotland and Wales. Their happy partnership was enhanced by their mutual hobby of educating people on the town’s history. They joined the Wokingham History Group in the 1960s when it was part of the Wokingham Society. They became valued members when they pointed out errors in a display of photographs at a presentation in the Town Hall. She was so proud of Ken when he was made Honorary Townsperson in 1997 for his contributions to community life. He was further honoured, after his death, when the service road behind Peach Street, where they lived, was named Goatley Way. Edna’s health began to decline soon after Ken died in April 2006 and eventually she was unable to leave her home. She never really came to terms over his loss and, even to the end, she still said that time never healed. Gradually she became more talkative and was very entertaining. Like Ken she had an excellent memory and was an excellent raconteur. Within minutes she would have the listener helpless with laughter. She never gave up her interest in the history of the town and was always pleased to answer questions. Although Edna will be missed by her many friends they will be relieved that she is now free from pain and, hopefully, reunited with her beloved Ken. Bill is extremely knowledgeable and a superb taxi trade historian and has been influential in identifying the taxis in our image archive.